Bank of Tanzania buildings. (file photo). Mtwara — THE country's banking sector soundness has improved further despite closure of five community banks over lack of adequate capital early this year. The sector stability, measured by Financial Soundness Indicators (FSIs), showed positive outcome to almost all points centred on capital adequacy, asset quality, earnings, liquidity and sensitivity to market risks. Central bank data showed capital adequacy ratio (CAR) has increased by 1.15 per cent to close 2017 at 18.92 per cent from 17.77 per cent in 2016. 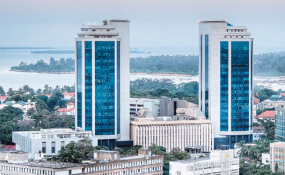 The raise, BoT's Banking Supervision Manager, Eliamingi Mandari, said this showed the sector was still performing well despite cancelling of five bank licences. "The CAR figure increase shows that the sector is strong, sound and safer," Mr Mandari told journalists at a seminar here organised by central bank. This means, last year capital adequacy ratio was above the industry benchmark of 10 per cent plus 2.5 per cent of buffer ratio. The banking sector total capital at the close of 2017 stands at 4.73tri/- against 4.28tri/- of 2016. Also the soundness showed further stability when measured by liquidity ratio that climbed up 40.13 per cent compared to 35.8 per cent in 2016. "The impact of five community banks that saw their licence revoked last year had minimal impact since their total assets represent 0.04 per cent total market share," Mr Mandari said. The sector stability recorded another milestone after total assets grew to 29.97tri/- in 2017 from 27.92tri/- in 2016 and deposits marched up after racking in 21.23tri/- in 2017 compared to 20.15tri/- in 2016. However, the sector experienced some hiccups in last year after non-performing loans ratio climbed up to 11.21 per cent in 2017 from 9.54 per cent in 2016. The industrial benchmark is 5.0 per cent. The NPLs dragged down earnings as return on equity dropped to 6.88 per cent from 8.88 per cent in 2016 while return on assets dipped to 1.61per cent from 2.08 per cent. The banking sector is left with 54 banks after five community banks were struck off the book and combined had 821 brick and mortar branches and 10,070 bank agents countrywide. According to Financial Stability Report of the Central Bank issued March last year, key financial soundness indicators for the banking sector depicted that the sector strengthened its capital adequacy and liquidity buffer. However, the loan portfolio quality deteriorated, squeezing profitability despite an increase in interest margin. The credit risk continued to persist, with higher provisions squeezing banks profitability and reducing credit flow to the private sector, as banks take precautionary lending stance. The Central Bank eased monetary condition to reduce cost of funding, engaged banks to take various options including loan restructuring and directed them to use credit reference bureau for loan underwriting as measures to contain credit risk going forward.